Although the U.S. Mint has not formally announced it, on March 28, 2019, they will make the 2019 Explore and Discover Coin Set (Product Code 19XGB) available to the general public. 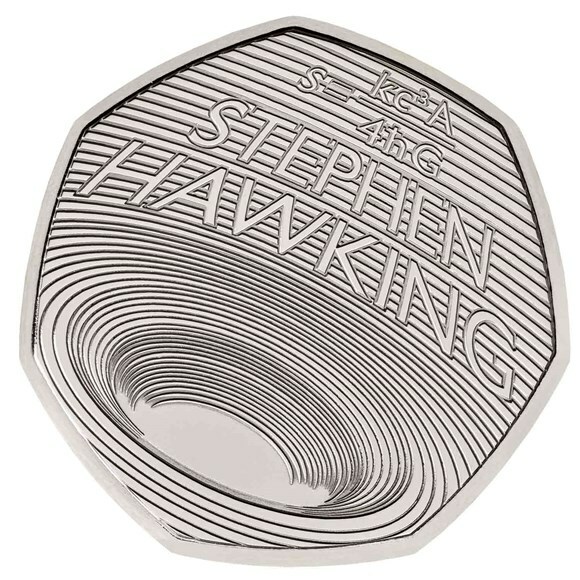 It is the second of three sets to be issued this year designed to get kids interested in coins. This set features new characters they call the Mighty Minters.™ According to the U.S. Mint, the Might Minters are “fun, diverse, and relatable ambassadors to children, parents, and gift-givers. Each character projects its own style while introducing a variety of new Mint products to kids.” Although the concept may seem cheesy to us alleged adults, those who deal with the diverse population daily understands that in order to get the younger people interested they have to be engaged on their level. I know. I know. It was different when we grew up. Back then you could still find silver coins in pocket change. Wheatback cents were about as common as Memorial cents are today. People even tried to use Susan B. Anthony dollars in their daily lives before confusing it with a quarter. Today’s children have a much different view on things. For one, if they are 18 years old or younger, they were born after 9/11 or were an infant and do not remember what happened. They grew up with the Internet, smartphones, and computers everywhere doing nearly everything. You can get access to everything at almost any time while their parents always bought things online. Not only is money still important but the United States government owns the world’s largest money manufacturing business. No other mint manufactures, sells, or is more profitable than the United State Mint. It is an agency that does not get enough credit for producing billions of dollars of goods that our economy thrives on. The U.S. Mint’s products are useful and collectible. And while there have been a few design issues, it is able to produce millions of versions of the art that people carry around daily and with an error rate that should make any company envious. Errors are a fun aspect of the hobby because the rate of the errors is low. This is likely why the U.S. Mint is including a blank one cent planchet in the set. Not only does it show what a coin looks like before it is struck, but it also introduces kids to error collecting. The Explore and Discover Coin Set introduce kids to the full range of circulating products produced by the U.S. Mint including the longest running design in the Mint’s history: Victor D. Brenner’s Lincon cent design. In addition to a 2019 Jefferson Nickel and Roosevelt Dime, they are introduced to the Kennedy Half-Dollar. One of the quickest coin designs ever produced, the Kennedy half-dollar is not circulated as half-dollars once were. Although there are a lot of theories as to why half-dollars stopped circulating, one was that the 1964 half-dollar, which was made using an alloy that was 90-percent silver, was saved by many in honor of the slain president coupled with the coin shortage that followed effectively ended the coin’s circulation. Also in the set is the first 2019-issued Lowell National Historical Park Quarter and 2019 Native American $1 Coin featuring American Indians in the Space Program honoring the achievement of Native Americans dating back to Mary Golda Ross (Cherokee Nation), the first Native American engineer at NASA. These are two coins that should help kids not only learn about the coins but also about the subjects they depict. This should not discount the dollar coin’s obverse of Sacagawea carrying her baby, Jean Paul Baptiste. It is another opportunity for the hobby purists to weigh in on how the U.S. Mint is getting it wrong before it sells out! Last week, the U.S. Mint reported that the sales of the Rocket Ship Set is close to being a sellout. With an announced limit of 50,000 sets, they said that 46,762 were sold. 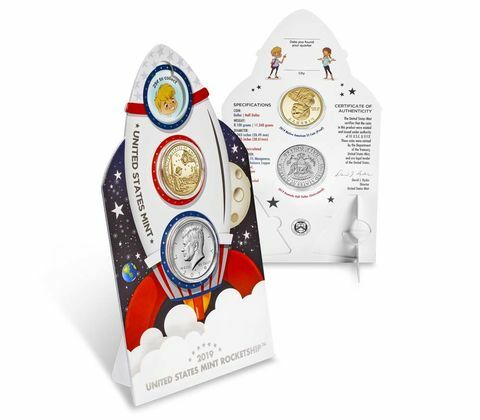 The Rocket Ship Set is a coin product produced for kids to tie in with the space theme generated by the 50th Anniversary of the Apollo 11 Commemorative Coin program. The set contains two coins: an uncirculated 2019 Kennedy Half Dollar an a proof Native American $1 Coin honoring American Indians in the Space Program. The coins are mounted on a card shaped like a rocket ship that glows in the dark and can be set up to stand up on a desk, shelf, or anywhere else. The text an the card explains the significance of the coins in honoring the space program written for children. When the set was announced, there was a lot of commentary how the U.S. Mint was wrong for doing this. I read and received emails saying that this is the wrong way to reach children that many thought this set would barely reach 15,000 units sold. While the numismatic snobs were throwing around adjectives like “dumb” and “stupid” claiming it is “bad for the hobby” and wondering out too loud what the U.S. Mint was thinking, customers bought up 93½-percent of the available inventory in two-weeks! Although we do not know how many of the sales are to dealers or other institutional buyers, the fact that there is that level of interest suggests the U.S. Mint might have a better idea as to what’s good for the hobby than the snobs. One of the most popular stories on this blog that people find via a search is “How easy is it to pass counterfeit currency.” I wrote it in response to watching a cashier use a pen with iodine-based ink used to determine whether the paper used is counterfeit and how it can be defeated. A lesson learned is that people do not pay attention or care, which is why the iodine pen is popular. 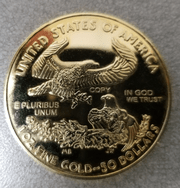 This is why the story of the week is about a person in suburban Des Moine, Iowa is wanted for passing a counterfeit American Gold Eagle coin. According to the story, the suspect, who has been identified, used the alleged gold coin to purchase $25 worth of merchandise from a gas station. The next day, the clerk who took the coin found it was fake after taking it to a local coin shop. Although the story does not say why the employee accepted the coin as payment, I speculate there was a greed motive involved. The suspect probably convinced the clerk it was real and that worth more than the $50 face value but was low on cash and needed the merchandise. The clerk thought that the coin is worth more took it hoping to make a profit. If the coin was worth more than face value, then why did the clerk not ask why the suspect did not take it to a coin shop himself? Even if you do not know the price of gold, why would someone try to use a valuable coin in a gas station? 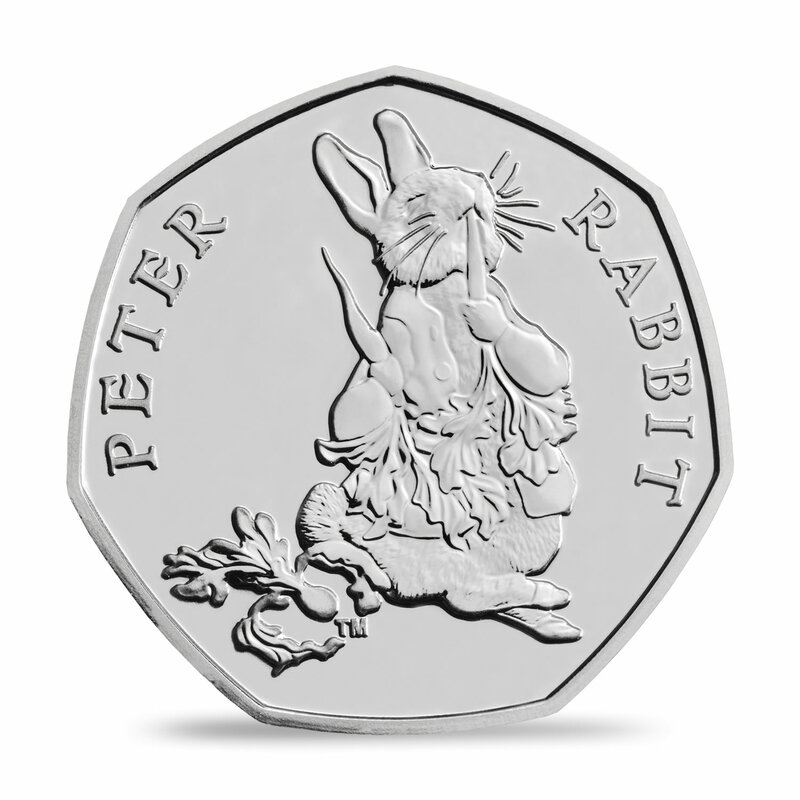 I have commented in the past about the perpetual hunt for “rare” 50 pence and £2 circulating commemorative coins in the United Kingdom. At least by publicizing the coins, Britons learn a little about the coins issued by the Royal Mint. In fact, if you are watching my Twitter feed (@coinsblog), I post stories about other countries that produce stories about coins put out by their country’s mints. Unfortunately, the best we get in the United States outside of the numismatic media is an infrequent blurb in a local news source. The Washington Post’s new motto is “Democracy Dies in the Darkness.” It also dies with ignorance especially when movie money is mistaken for real. It has been eight months since I opened my shop of treasures. While I have had fun most of the time one thing that has not happened is a good cash draw find. That is until recently. 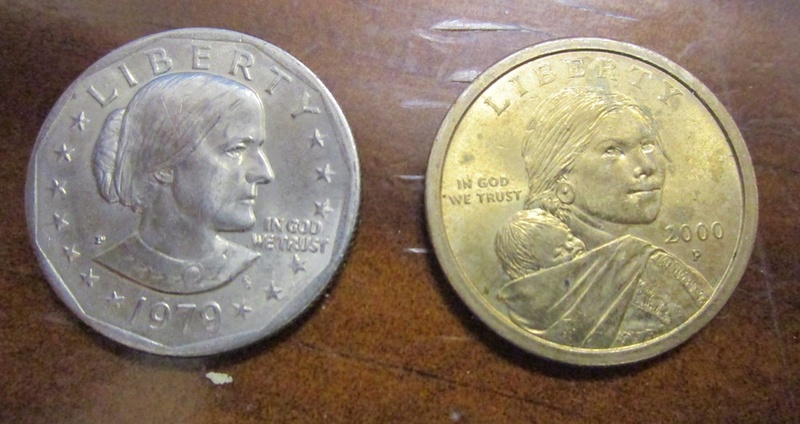 This past week, a customer bought a small item and paid for the under $3 purchase with three coins, a 1979-P Susan B Anthony Dollar, two 2000-P Sacagawea dollars. Of course, given the past problems with confusing a Susie B for a quarter, I took an extra glance at the coin to make sure. I think the patron was surprised I took the coins without question. I threw the coins in the far left slot and counted out his change. With a quick tear of the receipt and a nod, I thanked the customer for his business and he left. Later, I was telling someone about the transaction and was told the customer was testing me. Apparently, some people use dollar coins, half dollars and two dollars bills to test the store to see if the store knows enough to take the coins. I was told that the “pass rate” for this test is under 20-percent. I guess I passed! Earlier today, I passed one of the Sacagawea dollars out for change. 2013 British 10p coin. It looks better in hand! After hours, when it is time to close the books on the day, I was counting the change in the quarter bin and saw something odd. It was the size of a quarter but shinier. The U.S. Mint does not strike circulation coins this shiny. 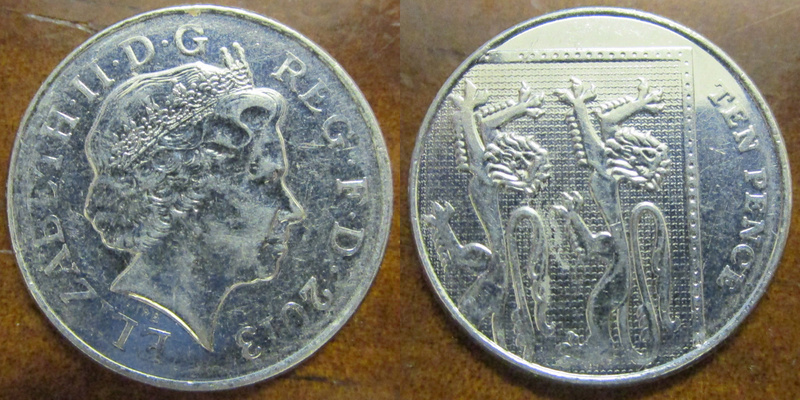 A closer look revealed that it is a 2013 British ten pence coin. It’s a cool find and worth 13-cents, but what is it doing in my cash drawer? I cannot blame anyone because my assistant was not in and I was the only one operating the cash register. I didn’t open a roll taking the blame off the bank. No, this is my fault and I lost 12-cents on the transaction! I thought I would find a loose Canadian cent or a Jamaican penny mixed in with the copper. Nope! Apparently, I didn’t pay enough attention and was handed 10 pence. After counting the coins, I replaced the British coin with a U.S. quarter that was in my pocket. My drawer balances but now I have my own lesson to pay attention! While searching the interwebs for numismatic-related stories there are pointers that lead to the British tabloids. Most of the stories are about the hundreds or thousands of pounds paid for a former circulating coin on eBay. Sometimes, their pages lead to different stories on their site that are very entertaining. Those who have read the New York Post would understand the format. This is not to say these publications are wrong, but they are prone to hyperbole and exaggeration. Take for example the story “Two million RARE 10p coins enter circulation – get one here” that was posted to the Daily Star’s website this past week. 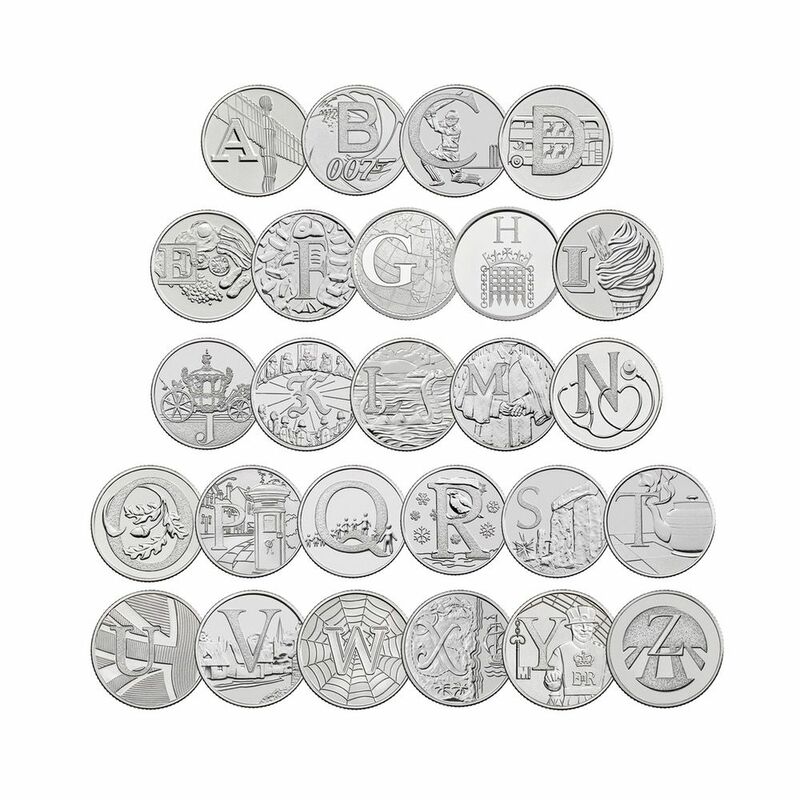 The title refers to the release of Royal Mint’s “The Great British Coin Hunt of 2019.” Using the same designs as last year, the Royal Mint will place into circulation 10 pence coins with 26 designs representing the letters of the alphabet. The Great British Coin Hunt started last October with the weekly release of several coins at a time until 2.4 million were placed into circulation. 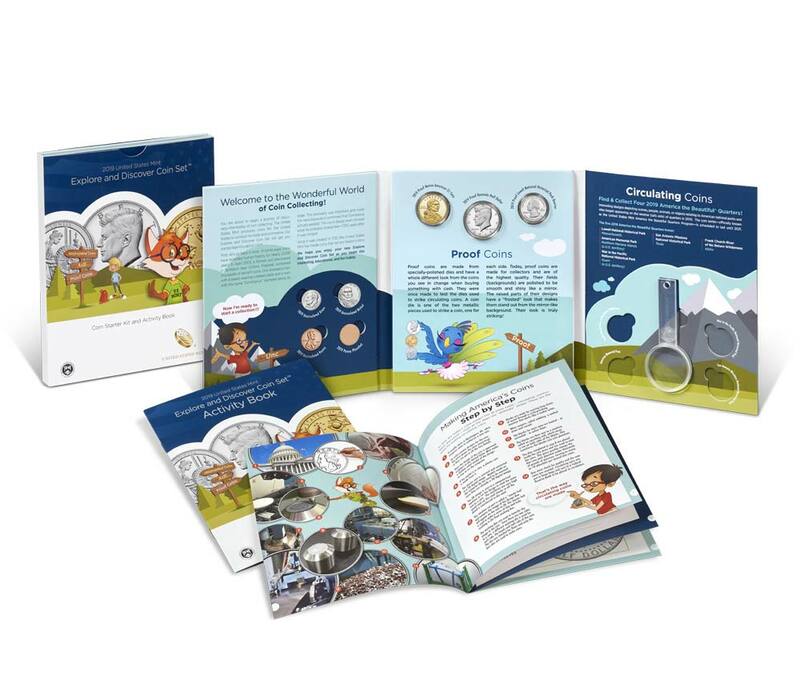 As part of the program, collectors can purchase a special folder from the Royal Mint (£9.90 or about $13.10) or other items to help people collect the coins. The Royal Mint also sells uncirculated 10p coins for £2 each. If you think that the U.S. Mint overcharges for their products, 10p is worth about 13-cents at the current exchange rate and £2 is about $2.65. Does packaging and other expenses cost $2.52 per coin? But to call 2.4 million coins rare may a bit of an exaggeration. If each coin has the same circulation, that means there will be about 92,000 coins per letter. Since the United Kingdom’s population is around 66 million people, that means only one-tenth of one percent of the people can collect these coins. The delay in reporting the weekly world numismatic news was because I worked at my first Comic Convention or Comic-Con. It was a small Comic-Con with between 60 and 80 vendors around a large hotel ballroom. Of course, each table had comics but others had different items related to the comics, science fiction, horror, pulp fiction, and similar works. As with any of the shows that I have worked, there were the serious collectors with want lists who were laser-focused on finding that gem for their collection. There were the collectors and those with a general interest who were there for the experience. They were looking at different items for something unusual. Finally, there were those who were there for the cosplay. Cosplay is a portmanteau (combination) of the words costume play. Aside from a visit by the likes of Darth Vader, Wonder Woman, and the Joker in the crowd, the best costume was the guy dressed as Iron Man. Ironically, the solid pieces of his costume were made from wood. It looked good but the wood seems odd given the character. What does my experience at the Comic-Con have to do with numismatics? It is a type of show that demonstrates how other hobbies adapt with their audience to lure new collectors. Rather than concentrating on making sure that every collector has the latest special edition of the No. 1 copy of the current story with their favorite character, it promotes fun, interaction, and does not judge each other because someone does not collect the four special covers of the No. 1 copy just issued by the comic book designer. There’s always a Joker in every crowd! A visit by Lord Vader himself! Numismatics claims to be all inclusive but if you ask most dealers what to collect, they will gravitate to most of the same answers. If they are not pushing gold the number of Morgan dollars in their cases is an indication of their preference. There are too many people with set ideas of what makes a good collection. And the problem is that the dealers are the wrong people to ask. They have an agenda over the perpetuation of the hobby. There is nothing wrong with that agenda because it contributes to their livelihood and the well being of their employees. Unfortunately, too many dealers pay lip service to the notion of collect what you like while pushing the latest set of VAMs on you. While thinking about the show as I was driving away with half-empty bins of inventory was that if the hobby was more inclusive to people who do not collect high-end merchandise. People have different tastes and there should be more dealers who not only cater to those tastes but should be given better access. Speaking of the dealers, if they want to be more inclusive and show consideration for the collectors they should stay until the close of a show on Sunday. When I participate in the many antique shows, flea markets, toy shows, sports shows, and now this Comic-Con, dealers are warned that if they pack up and leave early they may not be allowed to set up at a future show. Numismatic shows say this, including those sponsored by the ANA, but nobody follows through. Then we get a situation like in Baltimore where it is not worth attending on Sunday, my only day off this week. Finally, something should be done to make the shows fun. While I am not suggesting that people get dressed up like at the Comic-Con, there has to be something to make it fun. For example, the last time I attend the F.U.N. show, there were tables set up where Hobo Nickel artists were carving coins and making jewelry on the show floor. That was fun! Although there are dealers who give out low-value coins to young collectors, can we do something to make the show more fun for the casual collector? Does everything have to be about buying the next piece of stickered plastic that happens to have a coin inside? There have been some successful promotions including a chance to win an autographed Red Book but what about a drawing for a gift certificate? Hire a magician to do some coin magic to intrigue people. What about a walking exhibit where an expert in a non-mainstream area walks around and starts with, “Hey, let me tell you a story…” which involves taking a coin and talking about it beyond its grade. I am sure that someone can take a handful of tokens representing the area of the country where the show is and tie it with local history. Numismatics is not dying, but it is not adapting. Maybe if the shows can be made into a real event then more people would be willing to collect. Remember, the Comic-Con had aisles full of people on a Sunday, more than will attend the Whitman Show in Baltimore next week! Is this the fate of numismatics?